Background & objectives: Mosquitoes are responsible for transmitting several diseases, including malaria, dengue, chikungunya, filariasis, and yellow fever, etc. Release of larvivorous fishes is one of the cheapest method of vector management approach, with long suppression of mosquito population. The present study identifies the native larvivorous fishes and evaluates their potential larvivoracity for biological control of mosquito larvae in an endemic malarious region. Methods: During the year 2012–13, an ecological descriptive study was carried out in diverse aquatic habitats of fish species found in different areas of Ranchi district, in Jharkhand state of India. Fishes were captured using fishing nets, and identified and classified according to the available keys. Their larvivorous potential was graded according to their feeding potential. Data on current conservation status as well as their abundance were also recorded and analysed. Results: In total, 30 larvivorous fish species belonging to seven orders, 10 families and 21 genera were identified. 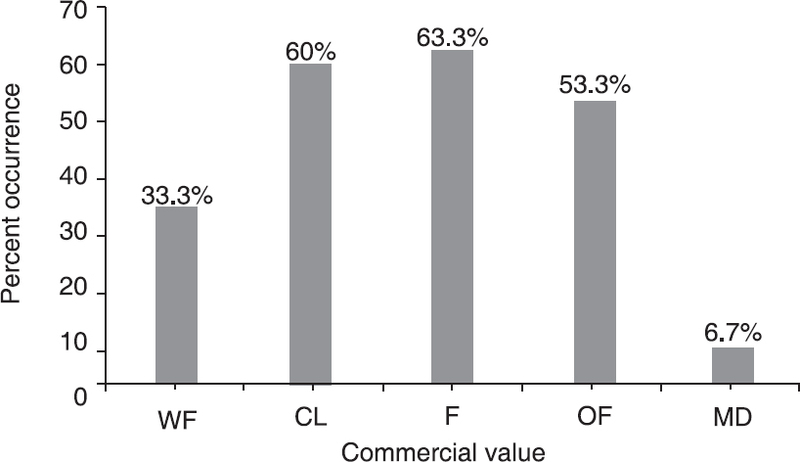 Order Cypriniformes and the family Cyprinidae were the most ascendant group constituting 66.7 and 60%, respectively. The grading assessment of larvivorous potential for different fish species revealed that, Colisa fasciatus possess maximum larvivoracity (+ + + + +). According to the conservation, assessment and management plan (CAMP, 1998), 60% species were at lower risk near threat (LRnt), while 86.7% species were at least concerned (LC) as per the IUCN, 2017 categorisation. All fish species preferred to inhabit in freshwater. Maximum species occurrence was found in the river (63.3%). Only 30% species were bottom feeders (BF). Interpretation & conclusion: The larvivoracity and habitat distribution analysis indicated that C. fasciatus, Oreochromis mossambica, Esomus danricus, Oryzias melastigma, Puntius sophore, P. ticto, Rasbora daniconius, R. elegans, Aplocheilus panchax, and Danio (B) rerio possess high-level larvivorous potentiality in nature and are recommended for malaria control in the study area. There is an increasing pressure on the fish fauna, of facing several threats, such as fishing, human interference, loss of habitat, overexploitation, pollution, siltation, trade, and diseases. Therefore, periodic survey and monitoring of fish biodiversity, demarcation of breeding sites, field level research study on the efficacy of these fishes, and public awareness on establishment of larvivorous fish ponds should be adopted as a part of the vector management approach in the endemic malarious region of Ranchi district in Jharkhand, India. Mosquitoes are small insects, which transmit various diseases, like malaria, filariasis, Japanese encephalitis, dengue, chikungunya, and Zika, etc. These diseases have become serious public health problems in the tropical and subtropical regions of the world. Multifarious approaches have been adopted for controlling the mosquito populations to reduce the incidence of vector-borne diseases, which includes chemical, physical and biological measures. However, use of chemical insecticides against malaria vectors, which started about five decades ago, has resulted in insecticide resistance in mosquitoes. Insecticides contaminate the food chain and possess serious health hazards, besides, evolving physiological resistances to the vector species resulting in failure of vector control methods and harmful effects on beneficial nontarget animals,. Also, the chemical and physical control measures are more expensive and time-consuming for regular entomological surveillance of mosquito breeding sites. These issues are the most important reasons for changing the national approaches to malaria control campaigns with integrated strategies including biological control methods. The biological control strategy against mosquito vectors is safe, friendly, and cost-effective in all type of habitats, i.e. natural and artificial. The biological control of mosquitoes involves introduction of their natural enemies likes parasites, disease organisms and predatory animals into the environment. Continuous usage of biological control agents has showed minimal side-effects on humans, domestic creatures and on wildlife. Among all the bio–control agents, use of larvivorous fishes are the most efficient method in mosquito control at their immature stages all over the world, since the early- 1900s,. Various indigenous fish species have been also used for mosquito control which provides dual benefits, e.g. reducing the mosquito populations and supplementing the economics of fish culture. In India, larvivorous fishes were experimentally used for the first time in 1904 for the control of malaria vectors in Mumbai City. Soon after that usage of larvivorous fish became a common practice for malaria vector control in India; however, during the 2000s there was decline in the usage of this strategy. In recent years, a few larvivorous fish fauna surveys were undertaken from various parts of the India to scale-up the biological control of mosquitoes. In 2007, Ghosh and Dash reported that 315 fish species under seven genera having larvivorous nature could be used as larvivorous fish in malaria control. In 2014, Ramarao reported 58 species of larvivorous fish from the lower Manair Dam at Karimnagar, Andhra Pradesh. In 2015, Rao et al reported 22 species of larvivorous fish (eight orders) from Lake Kolleru, Andhra Pradesh. Similarly, in 2016, Krishna et al reported 29 species of larvivorous fish from six orders, 14 families and 20 genera from Lake Kolleru. Use of larvivorous fish as part of the vector management approach remains under-exploited in India or elsewhere in recent times. There is an urgent need to strengthen the strategy, and to provide appropriate training, for the use of larvivorous fishes to scale-up the control of mosquitoes. Till date, systematic studies and surveys on the larvivorous fish fauna of the Jharkhand state have not been undertaken. Keeping this in view, this study aimed to find native larvivorous fish species and evaluate their potential activity for biological control of mosquito larvae in the malarious area of the Ranchi district of Jharkhand, India. Ranchi is situated in the central province of the Jharkhand state in India, and lies between 23° 35’ N latitude and 85° 33’ E longitude. The geographical area of the district is 177.19 km2. Its elevation from sea level is 2140 ft. Ranchi is in the southern part of the Chota Nagpur plateau, which is the eastern section of the Deccan plateau. The climatic condition of Ranchi is moderate due to the hills and dense deciduous forest. The main sampling sites and the rivers (Subarnarekha, South Koel and its tributaries) flowing through Ranchi district are shown in [Figure 1]. 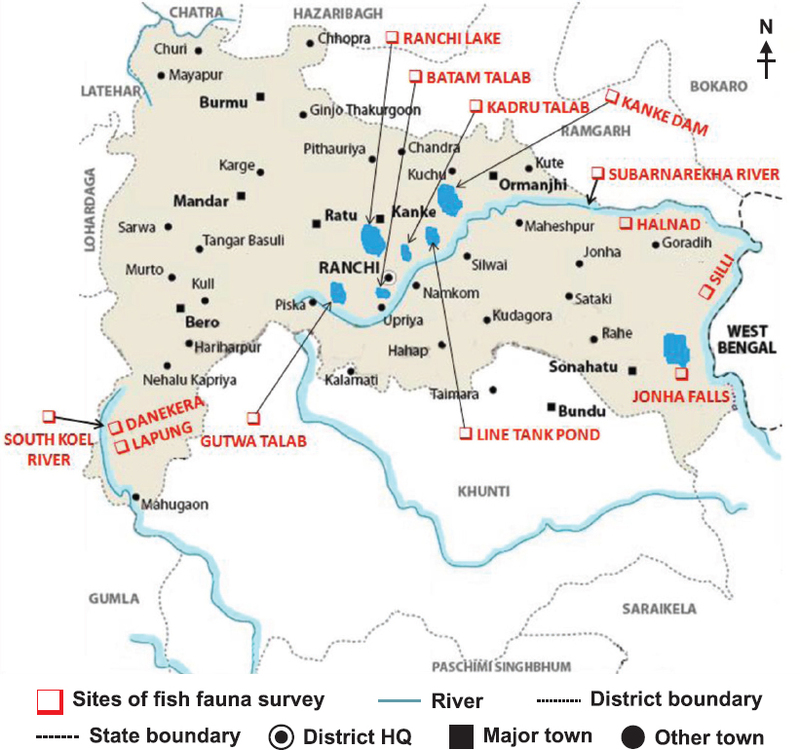 Figure 1: Map of Ranchi district showing sites of fish fauna survey. This ecological descriptive study was carried out in diverse aquatic habitats of fish species found in different areas of Ranchi district, during the year 2012 and 13. Fish fauna survey and collection was carried out in different water bodies including rivers, swamps, ponds, streams, water canals, tanks, and rice fields using the fishing nets and the local traditional fishing contraptions/ apparatus prepared by bamboo and thread, called lajal (pushing net), jakoi (basket trap), chepa (valve trap), and khoka during all the seasons. Photographs of the fish species were taken for appropriate identification before preservation. The bionomics of the habitats, where fishes were captured, was recorded in the form of ecological notes. Specimens were preserved in formalin concentrates (solution) according to their size. Smaller size specimens were preserved in 8% formalin and medium sized ones prior to the fixation, were incised longitudinally in the abdomen. Bigger size specimens were fixed by injecting 10% formalin into the muscles and abdomen area. The specimens were kept in a glass container with proper leveling and tail upward direction to avoid damage to the caudal fin for proper identification. Identification and classification of the fishes were carried out using the keys for fishes developed by Jayaram, and Talwar and Jhingran. The evaluation of larvivorous potential of fish species was carried out in the laboratory for seven consecutive days against mosquito larvae. The fishes were graded according to their feeding potential (Consumption of larvae/day: 100 or more = + + + + +; 75 - 99 = + + + +; 50 – 74 = + + +; 25 – 49 = + +; 1 – 24 = +). Data on current conservation status were also collected from the report on the Conservation, Assessment and Management Plan (CAMP) workshop on freshwater fishes of India, and IUCN Red List Category of Threatened Species,. Data on the abundance of different fish species, threats faced by the fish fauna, and their economic importance were recorded from direct observations (primary sources) and literature and reports (secondary sources),,,,,,. No ethical issues are involved with this study. The Microsoft’s Excel-2007 was used for statistical analysis of the data generated. The grading assessment of larvivorous potential for different fish species revealed that, it was highest for Colisa fasciatus (+ + + + +), followed by Oreochromis mossambica, Esomus danricus, Oryzias melastigma, Puntius sophore, P. ticto, Rasbora daniconius, R. elegans, Aplocheilus panchax, and Danio (B) rerio (+ + + +). Least potential was found in L. calbasu, L. rohita, Nemacheilus savona and Nemacheilus aureus (+). 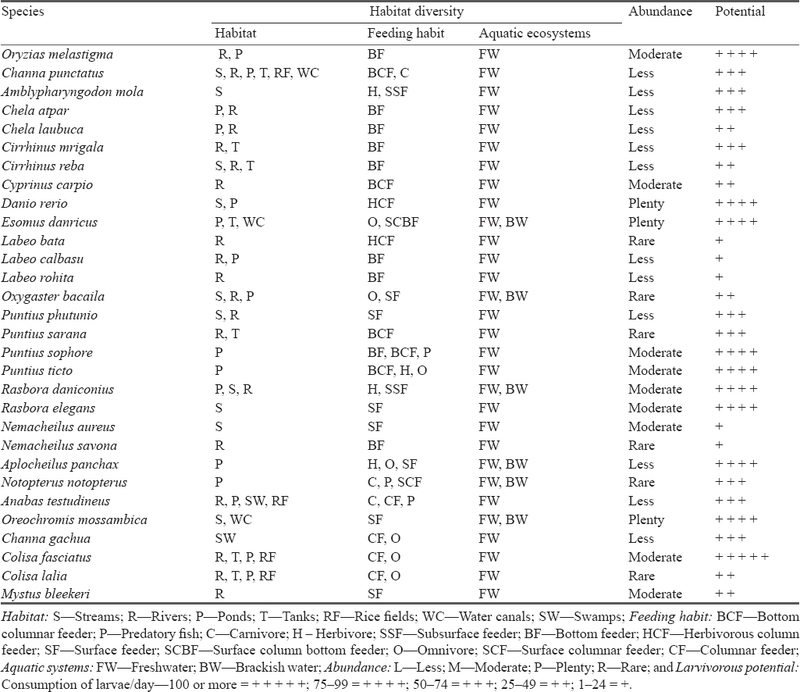 Laboratory evaluation of these 30 fish species indicated that only 10 freshwater fish species, namely C. fasciatus, O. mossambica, O. melastigma, D. rerio, E. danricus, P. ticto, P. sophore, R. daniconius, R. elegans, and Aplocheilus panchax possessed good feeding potential towards mosquito larvae [Figure 2]. Figure 2: High-level larvivorous potentiality recorded in 10 fish species found in Ranchi district of Jharkhand, India. The abundance and larvivorous potential for different fish species is presented in [Table 1]. The result revealed that 10% (3) species—D. rerio, E. danricus, and O. mossambica were most abundant; 30% (9) species—Cyprinus carpio, N. aureus, P. sophore, P. ticto, R. daniconius, C. fasciatus, O. melastigma, R. elegans, and Mystus bleekeri were moderately abundant; 40% (12) species—Channa punctatus, Amblypharyngodon mola, Chela atpar, C. laubuca, Cirrhinus mrigala, C. reba, Labeo calbasu, L. rohita, P. phutunio, A. panchax, Anabas testudineus, and C. gachua were less abundant; and 20% (6) species—L. bata, N. savona, Oxygaster bacaila, P. sarana, Notopterus notopterus, and C. lalia were rarely available in the study area. 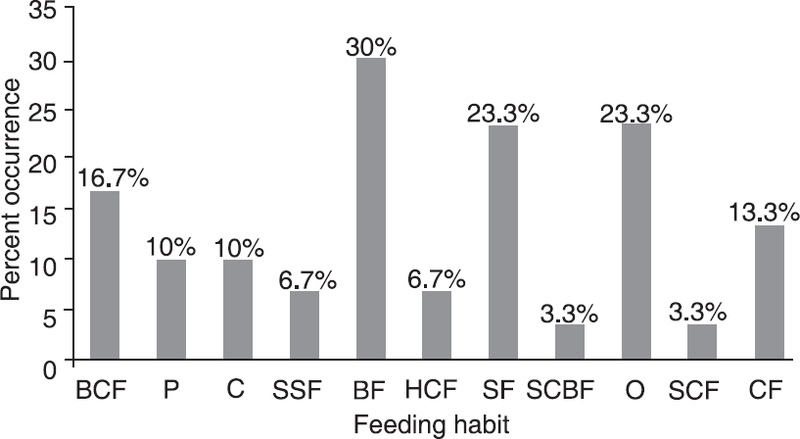 The feeding habits of the studied fish species indicated that 30% species were bottom feeders (BF), 23.3% were both surface feeders (SF) and omnivore (O), 16.7% were bottom columnar feeder (BCF), 10% were both carnivore (C) and predatory (P) in nature; and 6.7% species were both herbivorous column feeder (HCF) and sub-surface feeder (SSF) [Figure 3]. Figure 3: Percent occurrence of the fish species in accordance to their feeding habits; BCF—Bottom columnar feeder; P—Predatory fish; C—Carnivore; SSF—Subsurface feeder; BF—Bottom feeder; HCF—Herbivorous column feeder; SF—Surface feeder; SCBF—Surface column bottom feeder; O—Omnivore; SCF—Surface columnar feeder; CF—Columnar feeder. The diversity of fish species inhabited is presented in [Table 1] and [Figure 4]. The result revealed that 63.3% species occurrences were found in the rivers (R), 53.3% in the ponds (P), 33.3% in streams (S), 23.3% in tanks (T), 13.3% in rice fields (RF), and 10% in water canals (WC). All 30 larvivorous fishes recorded preferred to inhabit in freshwater; however, 10 species were recorded from both freshwater and brackish water regions. Figure 4: Percent occurrence of the fish species in accordance to their habitats; R—Rivers; P—Ponds; S—Streams; T—Tanks; RF—Rice fields; WC—Water canals; SW—Swamps. The conservation status, commercial importance, and threats to the larvivorous fish species caught from different water bodies in the study area are presented in [Table 2]. The result revealed the presence of 30 larvivorous fish species belonging to seven orders, 10 families, and 21 genera. Out of the total species, order Cypriniformes was the most ascendant group constituting 66.7%, followed by Perciformes with 16.7%. Order Cypriniformes comprised of two families with 20 species of fish, followed by Perciformes which included four families with five fish species ; and Beloniformes, Channieformes, Cyprinodontiformes, Osteoglossiformes, and Siluriformes, each (family) with one fish species. Out of 10 families recorded, Cyprinidae with 18 species contributed 60% to the total species followed by Nemacheilidae, Channidae, and Osphronemidae each with two species contributing about 6.7%, and Adrianichthyidae, Aplocheilidae, Notopteridae, Cichlidae, Anabantidae, and Bagridae each with one fish species contributing about 3.37%. According to the report on the CAMP workshop on freshwater fishes of India, 18 (60%) species were at lower risk near threatened (LRnt), 5 (16.7%) species were at lower risk least concern (LRlc), 5 (16.7%) species were vulnerable (VU) and for 2 (6.7%) species data was deficient (DD). As per the IUCN (2017) Red List Category of Threatened Species, 26 (86.7%) species were at least concern (LC), 1 (3.3%) at near threatened (NT), 1 (3.3%) is not evaluated (NE) and for one species (3.3%) data is deficient (DD). [Figure 5] shows the use and trade of the captured/identified fish species. Of these, 19 (63.3%) fish species were used as food fish (F), 18 (60%) were cultivable (CL), and 16 (53.3%) were used as an ornamental fish (OF). Medicinal value (MD) was found in 2 (6.7%) of the fish species. 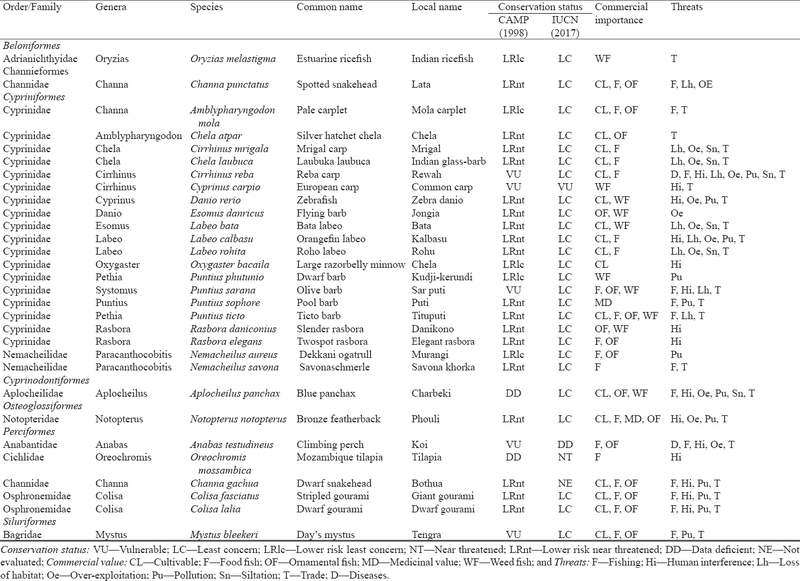 Figure 5: Percent occurrence of the fish species targeted in accordance to their use and trade; WF—Weed fish; CL—Cultivable; F—Food fish; OF—Ornamental fish; MD—Medicinal value. 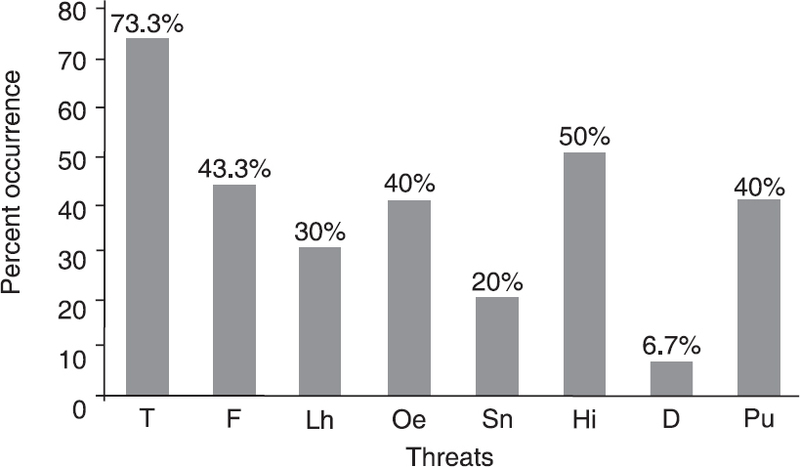 [Figure 6] shows different types of threats to fish population along with their habitats. Major threat (73.3%) observed was trade (T), followed by human interference (Hi) (50%), siltation (Sn) (20%), loss of habitat (Lh) (30%) and disease (D) (6.7%). Figure 6: Percent occurrence of the fish species according to their major threats to population & habitats; T–Trade; F–Fishing; Lh–Loss of habitat; Oe–Overexploitation; Sn–Siltation; Hi–Human interference; D–Disease;Pu—Pollution. Monitoring the diversity of larvivorous fish fauna for their evaluation as a part of mosquito vector management is important for public health, as the number of mosquito-borne diseases are increasing continuously across the globe, and spreading in the places, where they have not been reported. This study was undertaken in and around the Ranchi district of Jharkhand and is the first ever documentation of larvivorous fish fauna in the study area. Larvivorous fish has the potential to control various mosquito larval populations. Only few studies have been carried out on larvivorous fishes, investigation of the larvicidal efficacy of some indigenous fish species of the inland ecosystem, and utility of local fishes for mosquito control,,,,,. In this study, we classified the potential larvivorous fish species on the basis of their larvivorous efficacy and extensive distribution. A high-level of larvivorous potentiality was found in C. fasciatus, followed by O. mossambica, E. danricus, O. melastigma, P. sophore, P. ticto, R. daniconius, R. elegans, A. panchax and D. rerio. These fish species are being utilized for controlling the mosquito larval populations in the study area. The findings of present study are in agreement with the findings of previous studies carried out by Sharma et al, Phukon et al, Kusumawathie et al and Yadav et al in different ecosystems. The findings have been confirmed in a laboratory based trial carried out in the neighbouring state of Odisha (Rourkela), which showed that A. panchax, O. melastigma, O. mossambicus, Gambusia affinis, D. rerio and E. danricus possess high significant larvivorous potential against the mosquito larvae in various conditions,. The study showed the presence of 30 larvivorous fish species in the study area belonging to seven orders, 10 families, and 21 genera. Order Cypriniformes was found to be the most ascendant group of seven orders, and family Cyprinidae was found to be the most ascendant family among other nine families. The findings of the present study are similar to the reports of the earlier studies carried out by Krishna et al and Raju et al. Fish fauna is facing a serious threat due to several anthropogenic activities. Of the threats identified, T, Hi, F, overexploitation (Oe), and pollution (Pu) were the major cause of concern. Based on the report of the CAMP workshop on freshwater fishes of India, 18 fish species, viz. C. punctatus, Chela atpar, C. laubuca, C. mrigala, D. rerio, E. danricus, L. bata, L. calbasu, L. rohita, P. sophore, P. ticto, R. daniconius, R. elegans, N. savona, N. notopterus, C. fasciatus, C. lalia, and M. bleekeri were found at LRnt due to the negative effects of above mentioned threats. Maximum of the fish species reported in the study area was exploited for trade, which has caused biodiversity loss and affected the fish fauna status, as fish, is the key species in majority of the aquatic ecosystems. 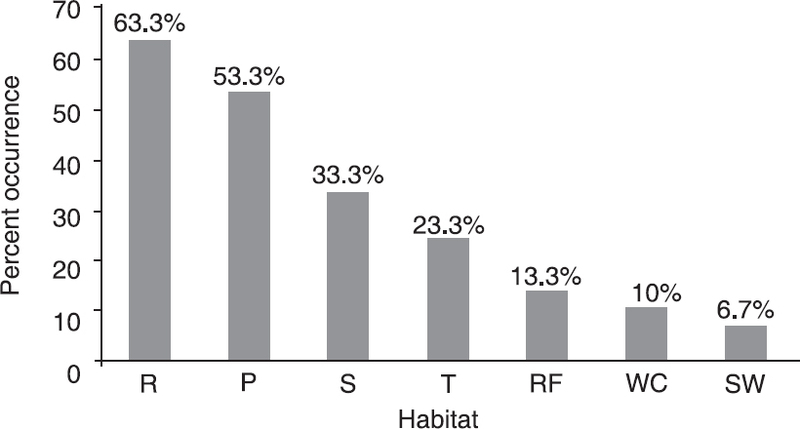 This study observed the dominance of omnivorous fish (23.3%) followed by carnivores (10%); which indicate an apparent sign of the suitability of the habitat for larvivoracity of the fish. All fish species were found to inhabit in the freshwater region because of the evolutionary process by which biological populations evolve in the habitats prefer a salinity <0.05%. Ornamental fish production is a popular and its commercial value viable business in many countries all over the world. This study revealed that 16 species were having ornamental value corroborating to the report of an earlier study carried out by Rao et al. Because of their ornamental value, some of these larvivorous fishes are also exploited directly from the river, and sold to the nearest aquarium shops providing multiple benefits to the stakeholders. Of these larvivorous fish species, 63.3% fishes are used as food (F) and 60% as cultivable (CL), which shows the suitability of the ecological characteristics of larvivorous fish development in these provinces, resulting in a feasibility of an integrated vector control approach which substantiates the suggestion made by Walker. The present study showed that nine fish species having widespread distribution, are abundantly available in the rivers, ponds, streams, water canals, and tanks in the study area, which indicates their sustainability and capability of tolerance to a wide range of ecological conditions. Labeo bata, O. bacaila, P. sarana, N. savona, N. notopterus, and C. lalia were rarely observed in the study area during sampling, which might be due to their specific feasibility with the habitat as suggested by Keith. Of the 30 larvivorous fish species observed in the study area, 10 fishes, namely C. fasciatus, O. mossambica, E. danricus, O. melastigma, P. sophore, P. ticto, R. daniconius, R. elegans, A. panchax, and D. rerio showed high-level larvivorous potentiality and were found abundantly in the local water bodies, and therefore, could play a significant role in controlling mosquito breeding in the area. These native larvivorous fishes could be used in the integrated mosquito control programmes. However, there is an increasing threat on fish fauna due to several anthropogenic activities like fishing, human interference, loss of habitat, overexploitation, pollution, siltation, trade, and diseases are causing the threat to the fish fauna. Conservation measures need to be implemented against these factors for developing a comprehensive action plan. Therefore, it is suggested to intensify research studies on various aspects of fish biology and its role in mosquito control around the Ranchi district of Jharkhand. Strategies like periodic surveys and monitoring, demarcation of breeding sites, creating public awareness should be adopted. Field level research and studies on the efficacy of these fishes as potential larval control agents are scanty. Further, studies aimed to assess the sustainability and efficacy of these fish species at the field level could be helpful in the vector management approaches against the mosquitoes. The authors are thankful to the local people in the study area of Ranchi district of Jharkhand for their cooperation and also grateful to the Director, National Institute of Malaria Research (NIMR), New Delhi and the Directorate of Fisheries. Funding for the study was provided from the Integrated Diseases Vector Control (IDVC) project of NIMR. Dutta P, Prakash P, Bhattacharyya DR, Khan SA, Gogoi PR, Sharma CK, et al. Mosquito biodiversity of Dibru-Saikhowa biosphere reserve in Assam. J Environ Biol 2010; 31(5): 695-9. Marcondes CB, Ximenes MFFM. Zika virus in Brazil and the danger of infestation by Aedes (Stegomyia) mosquitoes. Revista da Sociedade Brasileira de Medicina Tropical 2016; 49(1): 4-10. Available from: http://dx.doi.org/10.1590/0037-8682-0220-2015. Bhatt S, Gething PW, Brady OJ, Messina JP, Farlow AW, Moyes CL, et al. The global distribution and burden of dengue. Nature 2012; 496: 504-7. Gupta S, Banerjee S. Comparative assessment of mosquito bio control efficiency between Guppy (Poecilia reticulata) and panchax minnow (Aplocheilus panchax). Biosci Disc 2013; 4(1): 89-95. Sharma VP. Malaria: Eradicating mosquitoes without insecticides. Gujarat shows the bioenvironmental way. Sci Age 1986; 4(8): 49-54. Larval source management: A supplementary measure for malaria vector control—An operational manual. Geneva, Switzerland: World Health Organization 2013. Available from: http:// www.who.int/malaria/publications/atoz/9789241505604/en/ (Accessed on February 10, 2017). Collins LE, Blackwell A. The biology of Toxorhynchites mosquitoes and their potential as biocontrol agents. Biocontrol News Information 2000; 21: 105-16. Raghavendra K, Subbarao SK. Chemical insecticides in malaria vector control in India. ICMR Bull 2002; 32(10): 1-7. Walton WE. Larvivorous fish including Gambusia. Am Mosq Control Assoc 2007; 23(2): 184-220. Chandra G, Bhattacharjee I, Chatterjee SN, Ghosh A. Mosquito control by larvivorous fish. Indian J Med Res 2008; 127(1): 13-27. Gerberich JB, Laird MA. Bibliography of papers relating to the control of mosquitoes by the use of fish. An annotated bibliography for the years 1901–1966. FAO Fisheries Tech 1968; p. 75-80. Ghosh SK, Dash AP. Larvivorous fish in malaria control: A new outlook. Trans R Soc Trop Med Hyg 2007; 101: 1063-4. Ramarao K. A study on larvivorous fish species efficacy of lower Manair Dam at Karimnagar, Andhra Pradesh, India. Pelag Res Lib 2014; 5(2): 133-43. Rao JCS, Rao KG, Raju CHS, Chalam GS. Larvicidal efficacy of four indigenous ornamental fish species of Lake Kolleru. Ind J Bio Env Sci 2015; 7(1): 164-72. Krishna CH, Rao JCS, Veeraiah K. Diversity of larvivorous fish fauna in Lake Kolleru (AP), India. Int J Fauna Bio Stud 2016; 3(3): 24-8. Annual report of the Directorate of NVBDCP, 2017. Available from: http://www.nvbdcp.gov.in/home.htm (Accessed on February 10, 2017). Ranchi District Profile–Government of Jharkhand. Available from: http://wwwjharkhand.gov.in/web/ranchi/district-profile (Accessed on February 10, 2017). Jayaram KC. The freshwater fishes of the Indian Region. II edn. Delhi: Narendra Pulishing House 2010; p. 625. Talwar PK, Jhingran A. Inland fishes of India and adjacent countries. New Delhi: Oxford and BH Publishing Co. 1991; 1(2): 1158. Molur S, Walker S. Report of the conservation assessment and management plan. Workshop on freshwater fishes of India. Coimbatore, India: Zoo Outreach Organization/CBSG 1998; p.156. IUCN red list of threatened species 2016. Available from: www. iucnredlist.org (Accessed on February 10, 2017). Dev V, Shahi B. A preliminary report on larvivorous fishes in Sonapur PHC, District Kamrup, Assam. Delhi, India: Malaria Research Centre 1989; p. 147-51. Larvivorous fish of inland ecosystems. In: Proceedings of the MRC-CICFRI workshop, 27–28 September 1989. Delhi. Malaria Research Centre (ICMR) 1989; p.105-13. Haq S, Prasad H, Prasad RN, Sharma T. Availability and utility of local fishes of Shahjahanpur for mosquito control. Indian J Malariol 1993; 30 (1): 1-8. Sharma RC, Gupta DK, Sharma VP. Studies on the role of indigenous fishes in the control of mosquito breeding. Indian J Malariol 1987; 24(1): 73-7. Das MK, Prasad RN. Evaluation of mosquito fish Gambusia affinis in the control of mosquito breeding in rice fields. Indian J Malariol 1991; 28(3): 171-7. Prasad RN, Das MK, Virk KJ, Haq S. Use of Gambusia affinis on large-scale for control of malaria vector: An overview. In: Sharma VP, Ghosh A, editors. Proceedings of the MRC-CICFRI Workshop. Delhi, India: Malaria Research Centre (ICMR) 1989; p. 69-81. Sharma SN. Larvivorous capacity of some indigenous fish of Haryana state. J Commun Dis 1994; 26(2): 116-9. Phukon HK, Biswas SP. An investigation on larvicidal efficacy of some indigenous fish species of Assam, India. Adv Biores 2013; 4(3): 22-5. Kusumawathie PHD, Wickremasinghe AR, Karunaweera ND, Wijeyaratne MJS. larvivorous potential of fish species found in river bed pools below the major dams in Sri Lanka. J Med Entomol 2006; 43(1): 79-82. Yadav RS, Das MK. Role of Danio and Oryzias fishes in the control of mosquito breeding in rice fields. In: Sharma VP, Ghosh A, editors. Larvivorous fishes of inland ecosystems. Delhi: Malaria Research Centre (ICMR) 1994; p. 61-8. Yadav RS, Padhan K, Sharma VP. Fishes of district Sundargarh, Orissa, with special reference to their potential in mosquito control. Indian J Malariol 1992; 29(4): 225-33. CHS, Rao JCS, Chalam GS. Biodiversity and conservation status of Ichthyo fauna of Lake Kolleru, Andhra Pradesh, India. Int J Sci Res 2014; 3(5): 555-63. Reynolds JD. A review of ecological interactions between crayfish and fish, indigenous and introduced. Knowl Managt Aquatic Ecosyst 401(10): 1-10. Rao JCS, Chalam GS, Raju CHS. 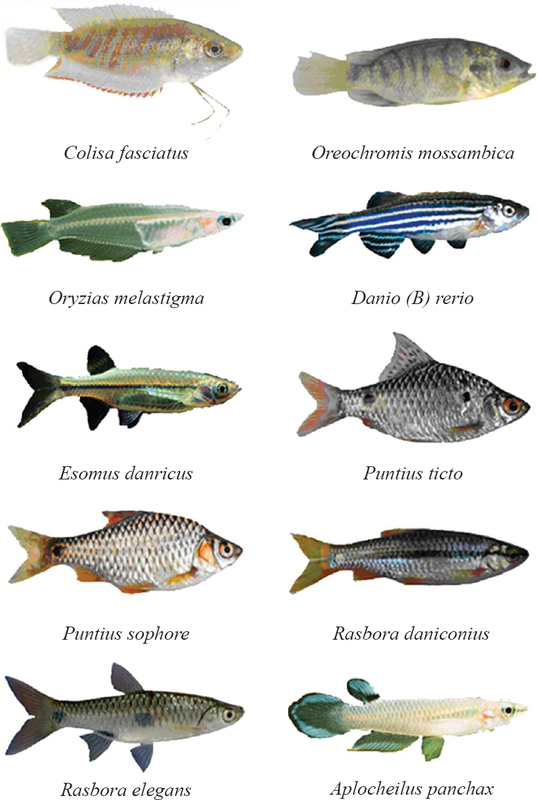 Ornamental fish diversity of Lake Kolleru, the only Ramsar site in Andhra Pradesh, India. Bull Environ Pharmacol Life Sci 2013; 2(7): 48-55. Walker K. A review of control methods for African malaria vectors: Activity report 108. Washington WA, USA: US Agency for International Development 2002. Keith P. Biology and ecology of amphidromous Gobiidae of the Indo-Pacific and the Caribbean regions. J Fish Biol 2003; 63(4): 831-47.